I am a massive SFF geek, as well as loving science (when I was at university, my main bus journey reading material was the latest issue of New Scientist). Having more hard science fiction epics at the cinema, especially those with blockbuster sized budgets, is very exciting. The 164-minute running time is not so exciting, however. I admit that I am from a generation of kids who prefer instant gratification – and a film that runs for almost three hours better be seriously action packed in order to keep my attention. 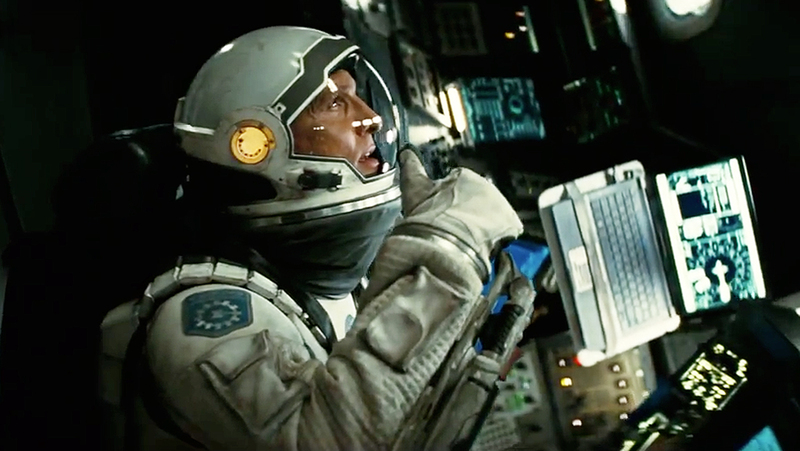 Unfortunately, Interstellar takes after films like 2001: A Space Odyssey and Star Trek: The Motion Picture. It is a visual masterpiece, with long sweeping shots of a ravaged earth, our solar system, and the potential new homes to human life. It calls to mind these other classic films, but Nolan seemingly worries that his audience is not clever enough to understand the concepts he is exploring. Rather than creating a lot of interesting questions and leaving them open to interpretation, Nolan ensures that we have explanations delivered to us at every step of the way. Interstellar is a film so deeply rooted in real (current) scientific theory that it barely dips its toe in the water of ‘science fiction’. Even when the film delves into territory that might seem a little far-fetched to most, the scientific theory is there to at least support the notion, in theory. The grounding of the film’s main premise in ideas that are easily recognizable, definite possibilities for our future, helps to keep the audience engaged even when the film travels into more outrageous territory. And while the film does explore some heavy scientific concepts, it is extremely easy to follow even for the layman. Director (and co-writer with his brother Jonathan Nola) Christopher Nolan has brought us a number of interesting, thought provoking films over the years. When he wasn’t working on the latest incarnation of Batman, he gave us Memento, The Prestige, and Inception. While Nolan thankfully never skimps on characterization and emotional depth, at the heart of all of his films is a fantastically bizarre and/or curious premise. These films push the envelope and encourage Hollywood to create better films by proving that there is an audience for intelligent, different films. The earth is dying. Every crop humans have grown eventually suffered from blight and was wiped out. The last remaining crop is corn, but when that too gets blight, they will have no other food source left. 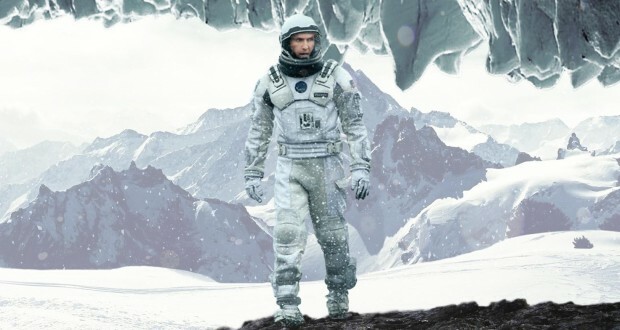 When ex-NASA pilot Cooper (Matthew McConaughey) stumbles across a secret NASA base, he is called upon to join a last ditch effort to save the human race and discover a habitable planet for human kind on the other side of a stable worm hole. Cooper must leave behind his family, knowing that with time dilation they may be older than he is when he returns, in the hope of being able to save them. With each new potential planet Cooper and his crew (including Anne Hathaway, Wes Bentley, David Gyasi, and a humorous robot voiced by Bill Irwin) visit, their hope dwindles. Will they find a planet capable of sustaining human life? Will Cooper ever get back to Earth to see his children? The imagery of mid-west America at the heart of science fiction films is not new, though it has been used heavily in recent years. Crops and dust remind the audience of the reality of this world, encouraging them to believe in this possible future they are being presented with. Problems with drought, farming, not enough food are all very tangible and believable issues – if it does happen in our future, it wouldn’t be the first time (though Interstellar’s version would be the most extreme case). I don’t think anyone could argue that Nolan isn’t a masterful director. The cinematography in Interstellar is beautiful. It is moody and epic in scale. Each new world has it’s own unique vision, within the scope of what we know and what could possibly be. My issue with the film has nothing to do with the quality of the shots, the score, or the well-executed dialogue, and everything to do with story. There is a story there, and a potentially very strong story… a man trying to fight to save his family as part of a wider struggle to save all of humanity from extinction. But the film is one that builds on tension, constantly throwing up ‘will they won’t they’ questions about survival and what will happen next. Unfortunately, there is just too much of the build up and not enough of the actual action. 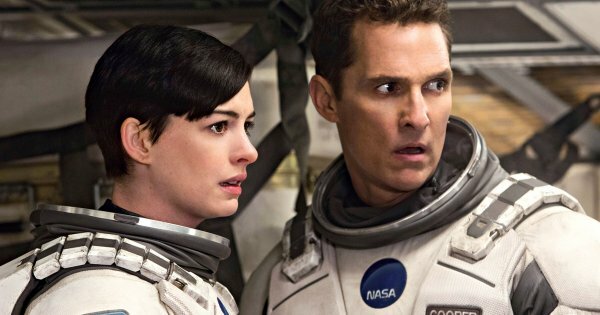 I am not suggesting that I ever thought Interstellar would (or should) be an action film, but not enough happens to change the story, or at least it doesn’t happen fast enough. It is great to have a last half hour that speeds us along with loads of questions, an emotional rollercoaster that has us on the edge of our seats – but it doesn’t make up for us being well and truly bored for the first two hours. The acting in the film is superb. 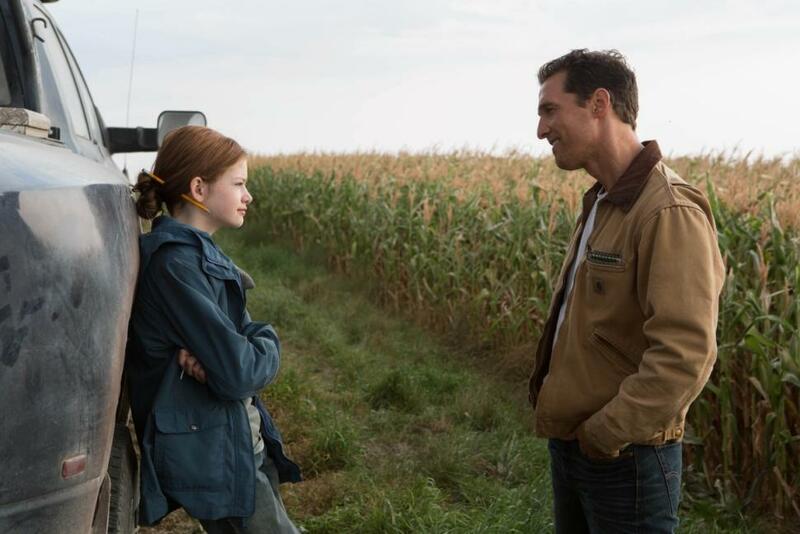 Matthew McConaughey and Jessica Chastain (as Cooper’s grown daughter) are flawless. Supporting roles by Michael Caine, Casey Affleck, Topher Grace, John Lithgow, and David Gyasi, among others help to build a rich world full of characters with their own personalities and motivations (no simple 2-D throwaway side characters). Anne Hathaway delivers her role well, unfortunately her character doesn’t have much to do or a very strong personality. 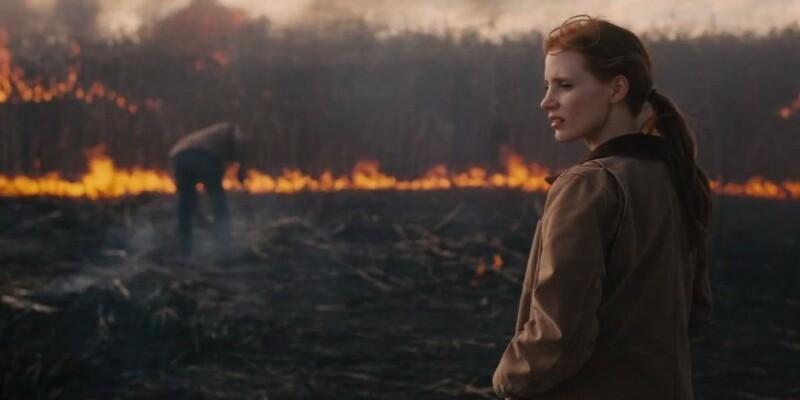 The woman of this film is definitely Chastain’s brilliant performance as Murph. TARS, voiced by Bill Irwin, is a pleasant surprise in the film – the humour in the most bleak points of the film tend to come from this sarcastic robot. Verdict: The film is smart, beautifully directed, and brilliantly acted. Unfortunately it is just too slow, failing to hold the viewer’s attention for its extensive running time.